Pack of 10 Cream Box with cream satin ribbon. Measures: approx 4.5cm x 4.5cm .. 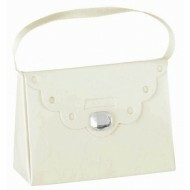 Pack of 6 Elegant little handbag shaped favour boxes in ivory colour with a satin look handle and..